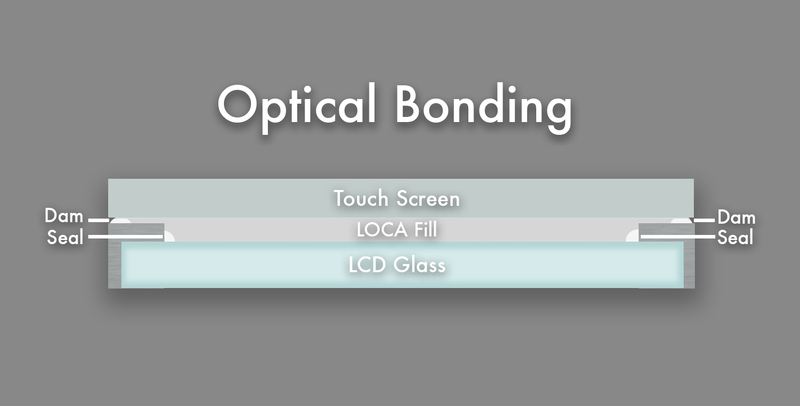 Optical bonding is a type of integration service that is used to laminate the touch screen (or other rigid material) to the top surface of the LCD. The bond is created by dispensing and then curing a form of optically clear adhesive between the touch screen and display forming a permanent bond with no air gap between the two components. There are many benefits to the optical bonding method of integration vs. traditional gasket attach methods, one of the most notable being the enhanced optics and improved impact strength. Improved transmission by removing internal reflections between the LCD and touch sensor glass. Improved viewing in bright ambient light conditions. Less power required to make the backlight brighter in high ambient or even normal viewing conditions. Can provide better impact, shock and vibration resistance for units that require a rugged environment. Elimination of any dust, dirt, or moisture that can collect between the sensor and display surfaces. Low haze and low yellowing fill material. Dam - UV Cured Acrylate material is dispensed around the perimeter to control the gap between the LCD and touch screen and control the perimeter flow of the fill material. Seal - UV Cured Acrylic material is dispensed around the inside edge of the LCD metal bezel to prevent fill material from leaking into the LCD. LOCA (Liquid Optically Clear Adhesive) Fill - Clear UV Cured Acrylate material that fills the space between the touch screen and LCD which both mechanically bonds the two parts together and eliminates reflections from the inside surfaces.